Bacon and pork – both tasty on their own, but put them together and you have a wowser of a dish. I used a Rosemary infused Olive oil to add a bit of extra flavor. I like to bake my bacon in the oven on a wire rack. It allows the fat to drain off, and fat has to be a factor when combining bacon and pork together, doesn’t it? You end up with bacon that still tastes great but has so much less fat than if you had cooked it on the stove top in it’s own grease. No amount of paper towels can get rid of that grease like a wire rack in an oven does. For this dish, I find it easiest to make half of the preparation earlier in the day and then pop these babies in the oven right before it’s time to eat. Makes the end of the day meal time much easier, so I can relax with my husband and not be tied to the kitchen when he comes home. Serve with a tomato, mozzarella and basil salad for an easy and fast week night meal. 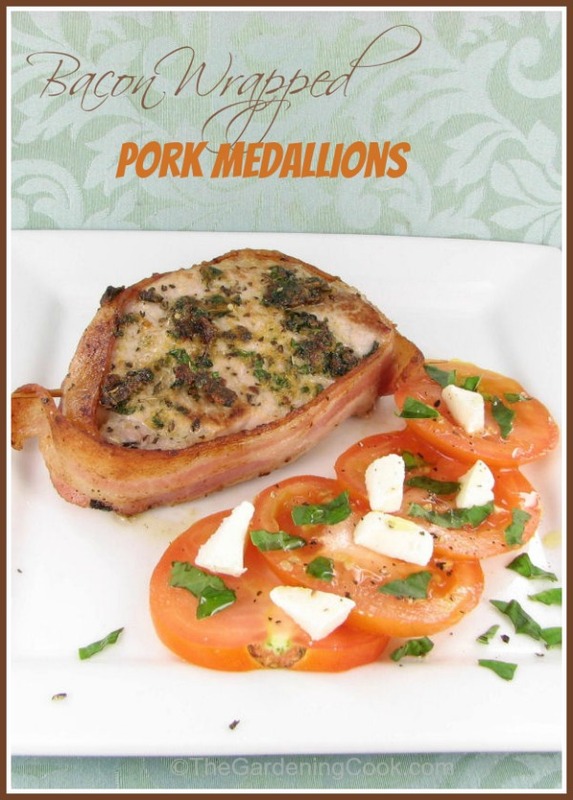 Wrap pork medallions with slices of bacon and season with fresh herbs for a quick and easy week night meal. Preheat the oven to 400º F (200º C). 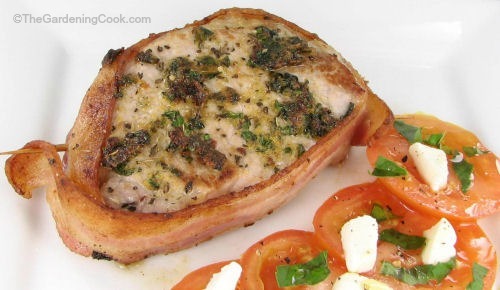 Place the bacon on a wire rack over a baking dish and cook for about 5 minutes until lightly browned but still flexible. Put the bacon slices on a paper towel and set aside. Combine the garlic powder, seasoning salt, basil, and oregano in a small bowl. Set aside. 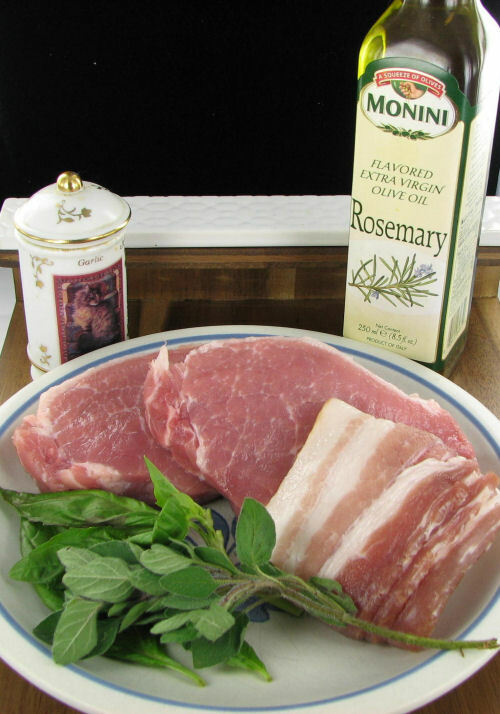 Wrap the pork medallions with the bacon strips securing with a toothpick. Sprinkle both sides of the medallions with the seasoning mix. Melt the butter and olive oil in a non stick skillet over medium-high heat. Cook the medallions for 3 minutes on each side until just lightly browned. 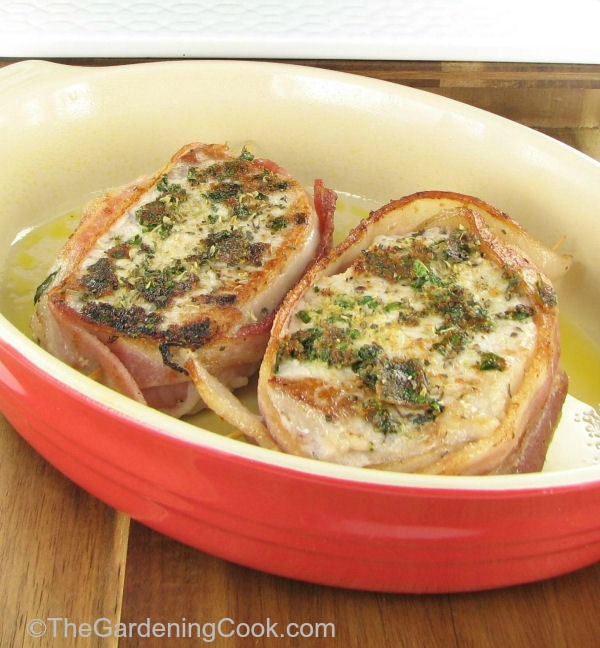 bacon wrapped pork medallions.Place the medallions in an oven proof baking dish and bake until the pork is no longer pink in the center, about 17 to 20 minutes.